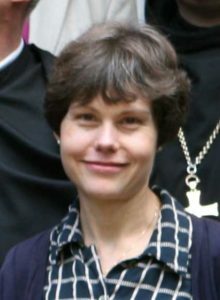 Dr Bridget Nichols is Lay Chaplain to the Bishop of Ely and a visiting Scholar at Sarum College where she also contributes to the MA programme in Christian Liturgy. Dr Nichols is the Church of England representative on the Liturgy Committee of the Catholic Bishops’ Conference of England and Wales . She completed her doctoral studies at Durham University, England, writing on Liturgical Hermeneutics: Interpreting Liturgical Rites in Performance. NICHOLS, B., Liturgical Hermeneutics: Interpreting Liturgical Rites in Performance, Peter Lang, Frankfurt 1996. NICHOLS, B., Literature in Christian Perspective, Darton, Longman, Todd, London 2001. NICHOLS, B., “A Tune Beyond Us Yet Ourselves: Ordinary Worship and Ordinary Theology” in Exploring Ordinary Theology: Everyday Christian Believing and the Church, eds J. Astley – L.J. Francis, Ashgate, Farnham, Surrey & Burlington VT 2013, 159-167. NICHOLS, B., “An Anglican Experiment in Appreciating the Liturgy: The Easter Day Collect (First Holy Communion) in The First Prayer Book of Edward VI” in Appreciating the Collect: An Irenic Methodology, eds. J.G. Leachman – D.P. McCarthy, St Michael’s Abbey Press, Farnborough, Hampshire 2008) 141-160. NICHOLS, B., “Liturgy as Literature” inThe Oxford Handbook of English Literature and Theology, eds. A. Hass – D. Jasper – E. Jay, Oxford University Press, Oxford 2007, 669-687. NICHOLS, B., contributions to A Companion to Common Worship, (2 vol.) Ed. P.F. Bradshaw, SPCK, London vol. 1, 2001; vol. 2, 2006. A chapter is forthcoming in The Study of Liturgy and Worship, eds. J. Day – B. Gordon-Taylor, SPCK, London November 2013. The Collect in the Churches of the Reformation, ed. B. Nichols, SCM 2010.